From left, Pasha, Vicky, and King Timahoe peer out of a White House window, Dec. 1, 1970. 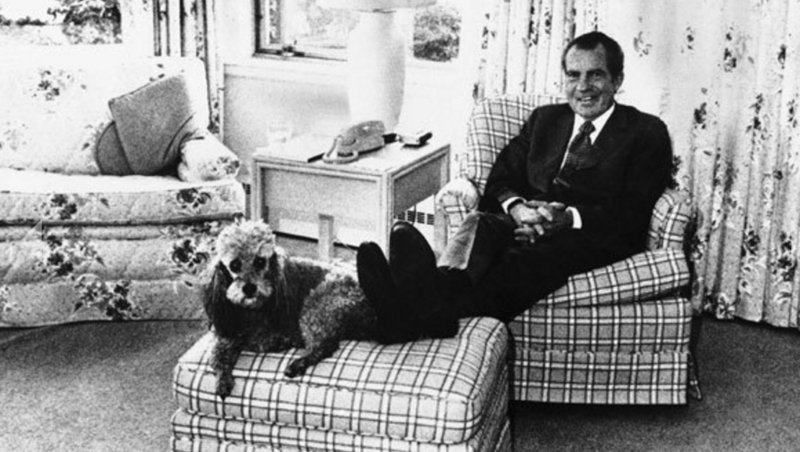 In January 1969, French poodle Vicky accompanied the Nixon family to their new home: 1600 Pennsylvania Avenue, more commonly known as the White House. At the time, Vicky had one sibling of sorts — a Yorkshire terrier named Pasha. But they were soon joined by King Timahoe, an Irish setter given to President Nixon. All three dogs got along famously, living both inside the White House and in a dog run outside the West Wing. In the dog run, Vicky enjoyed her own heated doghouse. Although Vicky was technically daughter Julie Nixon’s dog, she enjoyed taking walks with all members of the First Family. One day when First Lady Pat Nixon and her daughter Tricia were strolling through the gardens, Vicky noticed a goldfish pool. Before anyone could react, she pounced! Thankfully, a White House aide was with the trio and managed to rescue both Vicky from the pond and the goldfish from certain doom. President Nixon is shown in the White House with Vicky the night before he resigned in August 1974. Vicky had the distinction of attending Tricia’s White House wedding. She sat with King Timahoe and Pasha, all wearing flowered collars and watching the events. Vicky could also be spied spending time with President Nixon alone. On one occasion, Vicky was seen to nap in the soon-to-be notorious room where tape recordings captured conversations pertaining to Watergate. The night before Nixon resigned from office, Vicky curled up on an ottoman beside him, perhaps bringing a certainly troubled man some comfort.